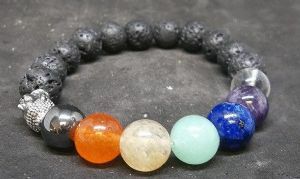 This elasticated bracelet is made up of black lava beads, plus seven crystal beads that are used to represent each of the chakras. Each crystal bead has been chosen because of its colour and the qualities that the crystal may possess. The bold colours against the black lava beads give the bracelet a lovely effect throughout the contrast with extra aesthetic added through a Buddha head bead. 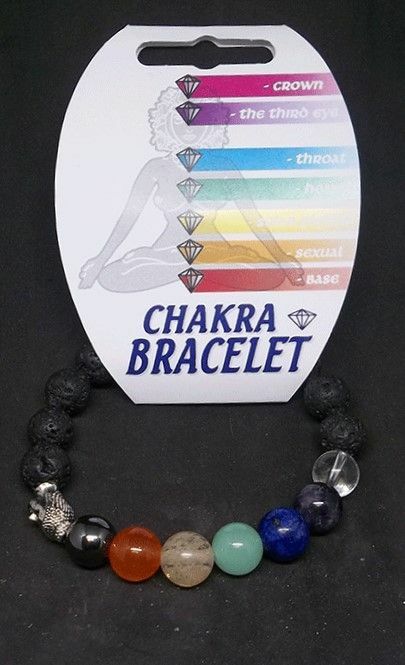 Each of the chakras have specific colours and gemstones related to their energy. These colours and stones will enhance the energy of these centers helping to restore balance and help you to deal with different issues in life (related to these energy centers). Agate/Carnelian - Stimulates creative feelings, nurtured emotions and sexual desire.